There are four Sergeants assigned to the Operations Division. The Sergeants are the front line leaders of the Placerville Police Department and are often refered to as Watch Commanders. Sergeants provide a vital role in the Police Department, as they ae responsible for not only leading their shift in the day-to-day operations; they also mentor, develop and coach our Police Officers. 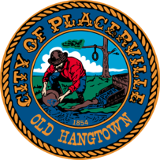 Should any member of the public we serve have a question or concern regarding an officer, they are encouraged to contact the Placerville Police Department Watch Commander at (530) 642-5280 or use the email link under the Sergeants photos above.